Ladies and gentlemen, please give a standing ovation to the original paper-thin games character. 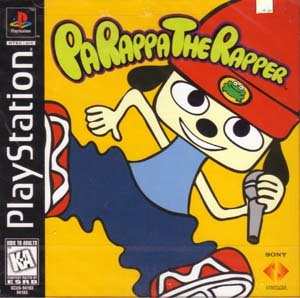 The most bizarre concept for a game, some of the most contrived storylines in games history, and the World’s Greatest Rapper… Parappa. 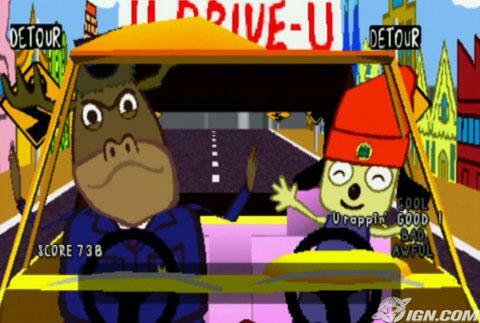 This game introduces so many concepts that at the time were “new” and revolutionary… The paper-thin character animation (Of course, revisited recently by the Wii’s Super Paper Mario), the “dancing-stage” style rhythm-based gameplay, and the hilarious voice-acting in cutscenes. Our hero is a young pup who has a crush on Sunny, a walking, talking sunflower. Maybe he has dreams of cocking his leg up and urinating on her, but as far as we’re concerned, it’s all about the lurve, baby. 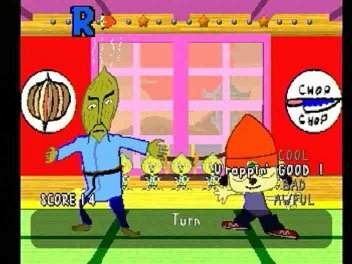 However, Parappa’s got his work cut out in charming the young bud, he has competition from another bigger, older dog, and as such finds himself competing for her attentions. All the tasks are completed by means of rhythmic rapping, usually following the “teacher” on each stage. However, you can progress beyond just being “good” by freestyling a bit, and at this point the teacher actually leaves you to it, just freestyle yourself to massive points, but you’ve got to be impressive with every set of beats you lay down. 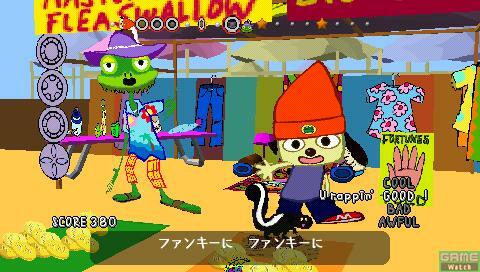 Still, Parappa’s charming original gameplay left an indelible mark on the games world, and although there’s actually very little to the game itself (it’s almost like one mini-game off Bishi Bashi Special in that respect), the sheer volume of content and entertainment contained within, combined with a supremely evil preciseness on the beat makes this game enough of a challenge and experience to make it worth shelling out for. Any way you look at it, this game is one you should try and play through at least once, if only to hear the entirety of the soundtrack.